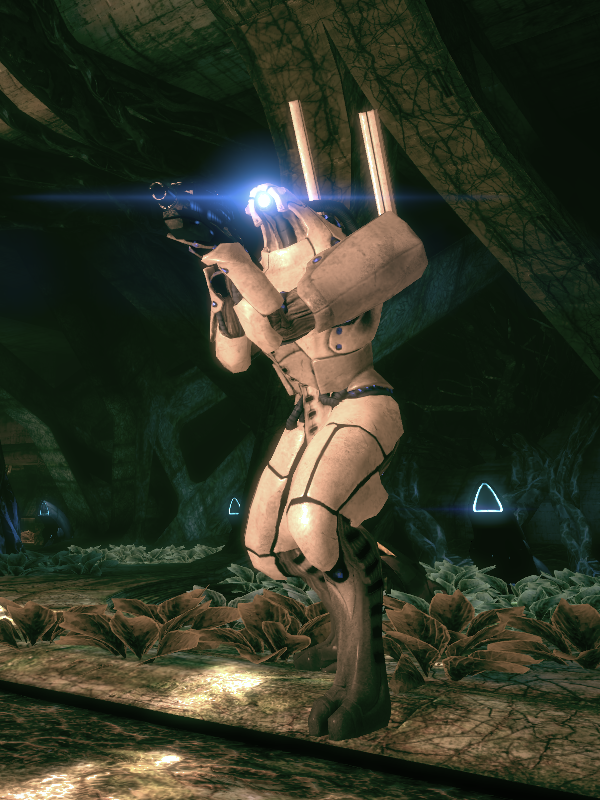 Since I have been enjoying Mass Effect a whole lot, I figured I'd write a review about it. Why I got it in the first place? In fact, I have no clue. I had seen ChazDragoon's test run of it quite a while back (it showed only the prologue, a bit of Citadel and some of the side-quest worlds there), and I wasn't really impressed by that. Although the fact that you can play as a darksider did add to my decision to get it. And the fact that it's a mix of TPS and RPG, both genres that I like. But other than that, I don't know why I chose it. I just felt compelled to get it for some reason. Now the animations. Well, so far this game is the hands down winner in animations quality from all the games I have ever played. It just blows my mind to think how long every little scene had to be modelled and animated - and at least in Unreal Engine 2, it does take a whole lot of time to set up a simple cutscene! And I have no idea how they managed to make the animation system similar to Unreal II where characters, instead of having one separate animation for every move, coordinate all their movements independently yet fluidly. I'm not an expert of UE3 yet, though, so it might be a part of it from the beginning. Or a modification to the engine. The dialogues - some people complain that there are way too many of them. But if you're like me and you value graphics style and story above everything else, you will like the dialogues. Especially since they are very rewarding - just by talking to people you get experience, respect points and sometimes even money, quests or items! Not to mention that they are very well done. Basically everything has voice acting - and not just any voice acting, but very well made one (thanks to the people who made the voiceover - they are very well known). The way elcor speak are priceless ("Geeenuuuiiine iiinquiiiiryyyy: iiiiis theeeeereeee aaaaanythiiiing youuuu neeeeed?.. "), and basically every race has its own unique way of speaking (like quick salarians or polite hanar), yet every member of the race sounds different than the others. So here I have no complaints at all (for quite some time I didn't figure out how to fast-forward dialogues, but it appears that all you need to do is use the space bar). And, to be fair, the game is a mix of an interactive story and an action game, so dialogues are an extremely important integral part of the game. Dialogues lead to another aspect - replayability. This is where Unreal II didn't make it, it has no real replay value, but Mass Effect shines here. While there was more promised, but even what is here is entirely enough to keep you motivated for *at least* three plays of the game. I have completed the Neutral way (which is kinda unrewarding since you rarely get respect points of either side here), going through the Dark side and I will surely enjoy going through the Light side. I am also amazed by how different the game can be - if you have someone else on a mission from your squad, you will always hear something else being said, and everything is said with the personality of the character in mind. On Noveria, if you don't take Wrex with you, you won't hear the dialogue "Shepard: Don't start fighting each other! Wrex: Hey, why not?.." - but you might hear a lot of different ones! That makes for near-infinite combinations and makes you feel the personality of every single member of the squad. So while replayability could be even better, there is loads of it here and then some more. Talking about that, the story is very immersive. It makes perfect sense and every little detail is explained with clarity. Plus, it is very, very serious and very touching. It's comparable to Heavy Rain in that regard, except that here you have all control over how you react to things (a scene with Ashley Williams comes to mind: "Ashley: I feel he is watching us from the grave... Shepard: He's not a zombie, is he? Ashley: Uhh, you know, the heavens? You don't have a problem with me believing in God, do you?.. "), so you have all control over how sensitive the scenes are. If you tell everyone to shut up and stop screwing around, they will, and won't mention it ever again. Now let's turn to gameplay. One of the most important aspects of the game is, of course, ranged fighting (what else did you expect from an Unreal Engine 3 game? :P ). And it's done remarkably well. You can hide under most things (and there are plenty of chest-high walls here, too) and it helps a lot. On my first playthrough, I was a soldier and all I did was rush inside a building, shoot everyone with my Assault Rifle (I don't know why but I always like Assault Rifles) and continue on my way. On the second playthrough, I'm an Infiltrator and I use a Sniper Rifle, so the strategy is very much different here - I usually order my colleagues inside while I provide cover with my Sniper Rifle. Biotics and tech abilities are very interesting as well. You have several special abilities that you can use during combat, such as Overload that overheats enemy weapons and burns them, Shield Boost that is sort of like First Aid for your shields or Adrenaline Burst that recharges your special abilities. Once used, they take quite a while to recharge, so it's quite important not to miss. You have two ways of using your abilities - either bind them to hotkeys for instantaneous use or use the tactical menu for that. The Menu is my kind of thing - it pauses the game and shows the status of all your party members and their special skills. There, you can take your time to decide which skill to use against the enemy, and not only can you choose the skill yourself, but also order your party members to use them. You can also switch weapons through it, but I tend to specialise in one weapon only - that cuts down both skill points that I need to spend learning how to use a weapon and credits I need to spend buying those weapons. Not to mention that certain classes can never learn to use certain weapons at all. Now about environments. That's one thing I don't like most about Mass Effect. In the main storyline (Missions section in the Journal) all environments are unique and very eye-pleasing, but if you're on non-essential quests (Assignments section in the Journal), all buildings look the same. Planets are all charming and unique, but what you can find on them is: a) Mercenary building, a two-storey building with one main section and three smaller rooms; b) Underground research base with one main hall, one entrance room and two reward rooms after a T junction; c) Mine, one entrance room, one large room and two more reward rooms; d) Starship, one entrance room, one big room, three smaller rooms at the back. And that's about all there is as far as I can remember, despite the fact that there are dozens of unique planets. And every time you enter a building, you'll see one of those 4 layouts. Crates are usually arranged differently and there is a unique cutscene, but the layout and textures are always the same! I have no idea why, too, since rearranging things in Unreal Engine 3 is a piece of cake. Maybe they just didn't want to draw new radar maps or something?.. Either way the first 4 times it's interesting, after that it becomes very boring and dull. On a related note, most items are interactive. Some crates are indestructible, but you can throw around chairs and tables if you want to. And you see that quite often, since biotic abilities such as Throw or Lift interact with the physics of the world. So that adds a feeling of interactive environments that is unfortunately not present in Unreal games. Speaking about throwable tables: one time on Feros, one of my squad biotics used Throw on an enemy geth and accidentally hit a table. That table landed right across our path, stopping our progress! What I then did was order that biotic to lift the table; I had just enough time to crouch through the table and reach my objective. When I had to retrace, I used Throw to push the table away a few metres and then managed to go around it. That was definitely spectacular. Oh, and you can destroy most small items, such as barricades, crates and roadblocks, with your Mako vehicle. That's another topic for discussion: the vehicle (there is only one in the game, unfortunately). The Mako is a rover that you'll use on every uncharted planet and on pretty much every mission with the exception of the Citadel missions. Fortunately, it's amazingly good - it has two firing modes (think Combat Assault Rifle from Unreal: Return to Na Pali with a whole lot more firepower): a machinegun (which can overheat) and an exploding shell (this can't overheat the gun since it fires very slowly). Both are hitscan. I basically use only the shells since they kill every single unit of infantry just as well as the machinegun, and the machinegun can't do anything about enemy turrets or Armatures. (Edit: Actually firing them both, like in RtNP, is the best option. The machinegun damage adds up over time.) The Mako has shields and health just like people, shields regenerate over time and health needs to be repaired (instead of medigel you use omnigel, though). One interesting function of the Mako is its thrusters. With them it can jump in the air for a few seconds. And since you can attack enemies from quite a long range (you are also provided with a very nice sniper scope there), enemy shock orbs or rockets can never hit you - you can just jump if you see them being near and they will never hit. and finally, the Mako has interesting physics - it's very bouncy and can climb very steep mountains. This was done on purpose, though, and is explained by an anti-grav core installed into the vehicle. There is one more aspect of gameplay - various minigames. There are quite a lot of different ones. For example, on Feros you need to solve a simple mathematical puzzle to achieve the objective; on Noveria, you need to play Towers of Hanoi (a logical "transport the part" puzzle); many of the lockers and some doors in the game are locked and require you to either play a game of you leading a triangle into the centre of a circle past a bunch of rotating red rectangles that reset all your progress on touch and stationary orange rectangles that just block your path, or pay an amount of omnigel to bypass it. These puzzles do add a change of pace to the game. About inventory management - it can be a little annoying with the loads of (mostly unwanted) items you get from basically everywhere, and with constant prompts "Do you really wish to reduce this item to omnigel? ", but for the most part it's good. (Edit: the prompts are fine, since for the most part converting things is not a good idea; the bigger problem is the limited size of the inventory. It can be modded, though.) The interesting part of the game is that you can do two things with your unneeded items - sell them for credits or reduce to omnigel; however, you can not buy omnigel, medigel and grenades. So if you want to get more omnigel and you don't wish to reduce any of your items, you can buy a few cheap ones and reduce them. An interesting thing is that you can buy all your sold items back from the merchants, and usually at the same cost. One good thing about inventory management is that you can see all the changes you make in real time - characters will show the items you're viewing and you can see how they would look on them when you click the Details button (of course, you can also simply equip them). The Omnitool is very impressive and I can't help but stare at it for a few seconds every time I open the inventory screen. The conclusion? A great game. Very, very well made. Story, graphics style, graphics use, environments, models, gameplay, sounds, replayability, and most of all - cutscenes, are simply incredible. I haven't seen most of these aspects so well made in any game I've recently played. The only downsides are repetitive building interiors and mostly silent music. So I guess I'd give it a score of 9.5/10 - so close to perfection that you can almost feel it.